Apathy is Pathetic!, Politick! Magazine, Issue 1, November 2008, pp.6-8. Yet the question and its implicit criticism remain with me whenever I listen to politicians. It sometimes seems as if they have all learnt the script of a lengthy party political broadcast by heart, and when asked about education, health or taxes, skip straight to the relevant key word in the text and reel off the next few paragraphs – and would go on indefinitely were they not interrupted by the hapless interviewer, who can only point out, inevitably, that they are not answering the question. Maybe the problem is that nobody knows the answers to these big questions, but politicians’ egos being a little larger than the average, they can’t admit it to themselves, let alone to us. Besides a lack of trust in the politicians, there is the overwhelming feeling of powerlessness. Despite our discourse of democracy, merely voting every five years for one of two parties who increasingly jostle for the political centre does not exactly make the individual feel very involved in the nation’s decision-making process. Democracy was designed for the small Greek city state of Athens: it is no easy to apply the model to a modern nation of over 60 million people. As has been said many times, it’s not the best system – it’s just better than anything else we’ve come up with so far. So far, so uninspiring. 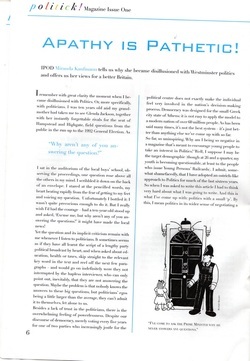 Why am I being so negative in a magazine that’s meant to encourage young people to take an interest in Politics? Well, I suppose I may be the target demographic (though at 26 and a quarter, my youth is becoming questionable, at least to the people who issue Young Persons’ Railcards). I admit, somewhat shamefacedly, that I have adopted an ostrich-like approach to Politics for much of the last sixteen years. So when I was asked to write this article I had to think very hard about what I was going to write. And this is what I’ve come up with: politics with a small ‘p’. By this, I mean politics in its wider sense of negotiating a modus operandi with our fellow citizens, as opposed to ‘big-P’ Politics of the sort that goes on in Westminster. The word ‘politics’ shares its root with the Greek ‘Polis’: the city (think metropolis). In cities, men (and for the last three thousand years it was mostly men, women being limited to the domestic sphere) had to learn how to get along and work together to achieve their ends in the crowded communal space. The problem with modern politics is that as our country is a lot bigger than Athens, it is often difficult to see how what goes on at Westminster relates to our daily lives, and, conversely, how anything we think or do will ever get noticed by those people who supposedly represent us. In this age of presidential politics, it is easy to overlook the role of local structures. Brown or Cameron? – who cares? Do you know who won your local council elections? Or did you just tick the red, blue or yellow box depending on your opinion of Gordon and David or Nick? The general lack of interest in the activities of local councillors allows many injustices to be perpetrated as quality journalists increasingly spurn local papers for the nationals so that many happenings of local importance go unreported. The democratic structures for making local change exist, but we don’t use them. Council meetings are unattended, MPs go unwritten to by their constituents. However, it is possible to change things for the better. rows of jars containing everything from pear drops to gobstoppers, is one of many unique establishments which line this idiosyncratic and diverse thoroughfare which runs east from The Plain Roundabout to Cowley village. Cowley Road is home to such a fascinating variety of cultures and peoples that it has inspired two books in the last five years: a history by Annie Skinner and Isolarion: A Different Oxford Journey, a more literary effort by James Attlee. Cowley Road celebrates its wonderful self with an annual Carnival every July: traffic is banished and the street comes to life with colourful costumes and exotic sights, smells and sounds. As I browsed the fabulous costumes in Bead Games, deliberating whether to spend the night as an Arabian princess or a New Orleans can-can girl, I got involved in a long conversation with the proprietor, who was engaged in a battle to save the Cowley Road from becoming just another carbon-copy high street. Cowley’s unique character was, and is, under threat: Tesco’s and Subway had already landed, Costa Coffee was opening a branch in a few days’ time. The danger is that these national chains will drive rents up so high that small businesses can no longer compete. Unikki, a small, aptly-named boutique, and Cooper’s, a newsagent that had been on the corner of Marston Street for 60 years, had already shut down in the last month. This got me thinking. Do we want all our high streets to look the same? This is an issue we don’t have to wait five years to vote on: we make a political decision every time we open our wallets. Cowley thrives predominantly on the student pound, therefore students have the power to decide what kind of shops are there, by choosing carefully which businesses they patronise. Boycotting Tesco’s on the Cowley Road is a pleasure: besides a weekly farmers’ market in the East Oxford Community Centre, the road boasts Greek, Italian and Moroccan delis, an Asian supermarket and most recently, a Polish food shop. Not to mention a wide variety of restaurants serving every conceivable cuisine from Japanese to Jamaican (Jerk Chicken with rice’n’peas, anyone?). Eating in this way not only improves the quality and variety of your diet, but it can even work out cheaper, as I found when I experimentally avoided supermarkets successfully for a month last November. So, after my conversation in Bead Games, I went home and set up a Facebook group, setting out the problem, and inviting people to join if they wanted to help preserve Cowley’s character. Overnight, membership grew to 80. Not huge, but a start (a year later, it now stands at 126). A few days later, BBC Oxford called me up, having seen my Facebook group, and asked me to speak on their breakfast programme. I would like to report that hearing my words on air caused the citizens of Oxford to force the chain stores to shut up shop, but must settle for the more modest point that Bead Games, and many of Cowley’s other jewels, are still open for business, and that with very little effort I had put my point of view across to thousands. It is vital that every one of us turns off our i-pod, removes our head from the sand, and opens our eyes and ears to what is going on around us every day. It is only by becoming active citizens that we can hope to combat inequity in our society. It’s all too easy to shrug one’s shoulders and say ‘It’s none of my business.’ But we should make it our business. Human ingenuity has invented the wheel and the Wii. If properly harnessed, might our ingenuity not be able to solve problems in our society too? What I’m trying to say here is that politics doesn’t begin and end with Westminster. Any of us can make a difference to our own life and those of the people around us if we stand up for what we believe in. Our society is equipped with all the tools we need: a free press, a stack of soap boxes at Speaker’s Corner and the exciting new forum provided by the Internet, with its blogs and social networking sites. In America, a grassroots politics movement is burgeoning thanks to the emergence of blogs dealing with local and national issues, such as www.dailykos.com, which recently organised a national conference, Netroots Nation in Austin, Texas, which was attended by over 2,000 people. The trend has travelled across the Atlantic, and, appropriately enough, landed on the west coast of England, in the form of the Cornish-generated Parallel Community, www.parallelcommunity.com. There are two elements here: the importance of being aware of the issues playing out around us on a daily basis and the knowledge that our daily actions can have an effect. In our capitalist society, one of the biggest political statements we can make is how we choose to spend our money. It behoves us, as active citizens, to make informed decisions. Read the papers and the blogs, listen to local radio, have real conversations with the people you meet every day in the newsagents or on the bus. Think about where your food comes from, who made your clothes and in what conditions, whether you prefer to support the local butcher or Tesco’s battery hens. And act accordingly. And discuss it with others. And if you still don’t feel like you’re making a difference to the world, go online and buy a library for a school in India for £40. [www.giveindia.org] Then, next time you meet your local MP, you might be able to give him or her some answers to those big questions.